Aisling is the youngest member of Dental Excellence team. She has been with Dental Excellence since the very early stages of our beautiful practice opening. Aisling studied in Athlone Institute of Technology and graduated with a Higher Certificate in Dental Nurse in 2016. Before working with us Aisling worked in customer service for 2 years whilst at college. Aisling is a real peoples person and loves to make people laugh. 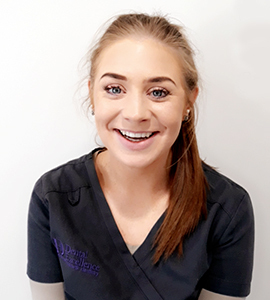 Aisling’s favourite area of dentistry is cosmetic work and watching the transformation of patients; bringing their smile back and gaining their confidence again. She also loves working with children, ensuring they receive the best experience possible, so that they actually enjoy coming to the dentist and don’t develop a phobia of treatments.